The Chiefs–Raiders rivalry is considered to be one of the National Football League (NFL)'s most bitter rivalries. Since the American Football League (AFL) was established in 1960, the Kansas City Chiefs and Oakland Raiders have shared the same division, first being the AFL Western Conference, and since the AFL–NFL merger in 1970, the AFC West. The Chiefs lead the series 60–52–2. The Chiefs are ahead in playoff match-ups with a record of 2–1. The Chiefs are one of only four teams in the NFL with a winning record against the Raiders (with 10 or more contests). The teams first met in 1960 when the Chiefs were known as the Dallas Texans. The Texans defeated the Raiders 34-16 in the team's first game at Oakland, while the Raiders defeated the Texans 20-19 at Dallas. The rivalry did not become so apparent until the Kansas City Athletics baseball team moved to Oakland, California, in 1967. In 1969, the Kansas City Royals expansion team was placed in the same division as the Athletics. The 1966 Chiefs team participated in the first AFL-NFL World Championship Game, later known as the Super Bowl. The Chiefs and Raiders had identical 12–2 records in 1968 and faced off in a playoff game to decide who would go to face the New York Jets for the AFL Championship. The Raiders won, 41–6. The following year, in 1969, the Raiders beat the Chiefs twice in the regular season and went on to win the AFL Western Conference title. The teams met in the 1969 AFL Championship Game at Oakland and the underdog Chiefs won 17–7. The Chiefs participated in Super Bowl IV a week later and defeated the NFL's heavily favored Minnesota Vikings. It was not until 1976 that Oakland won their first Super Bowl championship. In the first meeting between the teams during the 1970 NFL season—both teams' first in the newly merged NFL—the Chiefs held a 17-14 lead late in the fourth quarter and appeared ready to run out the clock. Chiefs quarterback Len Dawson rolled right and gained enough yardage for a first down, and as he fell to the ground, Raiders defensive end Ben Davidson dove into Dawson with his helmet; in retaliation, Davidson was attacked by Chiefs wide receiver Otis Taylor. After a bench-clearing brawl, Davidson and Taylor were ejected, and the penalties that were called nullified the first down under the rules at the time. Kansas City was forced to punt. The Raiders took advantage, as George Blanda made a 48-yard field goal with 8 seconds left to secure a 17-17 tie. The tie proved to be costly for the Chiefs, as Oakland clinched their first AFC West championship with a 20–6 victory in Oakland in Week 13. Due to this incident, the NFL changed the rules so that Davidson's personal foul would have been enforced at the end of the play, and Taylor's penalty would have been assessed only after the Chiefs had been awarded a first down. The Chiefs defeated the Raiders 42-10 in the 1975 season, prompting the Chiefs' live horse mascot Warpaint to circle the field after each touchdown scored. After the game, Raiders coach John Madden said "We couldn't beat the Chiefs, but we damn near killed their horse." The Raiders won two more Super Bowl titles in 1980 and 1983 while the Chiefs were considered to be one of the worst teams in the NFL. The Raiders won most of the games between the 1970s and 1980s. Following their victory in Super Bowl IV, the Chiefs returned to the playoffs in 1971, but lost in double overtime to the Miami Dolphins in the divisional round in the longest game in NFL history, the final game at Kansas City. Following that loss, Kansas City did not return to the playoffs until 1986. 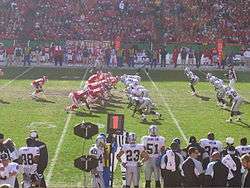 In the final game of the 1999 season, the Chiefs and Raiders faced off at Kansas City. A win for the Chiefs would put them in the playoffs. A game plagued by special teams mistakes for the Chiefs, including three attempted kickoffs that ended up out of bounds by kickoff specialist Jon Baker, helped keep the Raiders in the game and stop the Chiefs from sealing the victory. The game went into overtime and, helped by favorable field position after the third and final kickoff out of bounds, former Chief Rich Gannon drove the Raiders into Chiefs territory, setting up the game-winning field goal and knocking the Chiefs out of the playoffs, their first win at Arrowhead since 1988. On October 21, 2007, the Chiefs defeated the Raiders for a record ninth straight victory. On November 25, 2007, the Raiders defeated the Chiefs in Arrowhead for Oakland's first victory over Kansas City since December 23, 2002. On September 14, 2008, the Raiders defeated the Chiefs 23–8 for the second straight time in Kansas City. Rookie Darren McFadden compiled 210 rushing yards and a touchdown. On November 30, 2008, the Chiefs defeated the Raiders for the sixth straight time in Oakland. On September 20, 2009, the Raiders defeated the Chiefs 13-10, in Kansas City for the third straight time. The Chiefs became one of the few teams to lose to quarterback JaMarcus Russell. On November 15, 2009, the Chiefs defeated the Raiders 16-10 in Oakland Coliseum for the Chiefs' seventh straight victory in Oakland. On November 7, 2010, the Raiders defeated the Chiefs in OT 23-20 in a match-up that revived the Chiefs–Raiders rivalry. It marked the 99th time these teams have met in the regular season and 102nd overall. On January 2, 2011, the Raiders defeated the Chiefs in Kansas City for the fourth straight time, 31-10, to finish a sweep of the AFC West. On October 3, 2011, a Raiders fan filed a lawsuit against the Chiefs and two unidentified Chiefs fans, claiming that security did nothing as he was beaten during a brawl at Kansas City in 2009. The Chiefs broke Oakland's six-game winning streak in Kansas City on October 13, 2013, when they defeated the Raiders, 24-7, in a game where Kansas City set a then world record for the loudest open-air venue at over 137 dB. On November 20, 2014, the Raiders snapped a 16-game losing streak in Oakland against the Chiefs while Kansas City was in a four-game winning streak the week after the Chiefs defeated the defending Super Bowl champions, the Seattle Seahawks. The loss ended up costing Kansas City a playoff berth. Through the 2015 NFL season, the Chiefs and Raiders have played 111 regular season games and three post-season games against each other. The Chiefs lead the series 58-51-2 in regular-season play and 2–1 in post-season meetings. The Chiefs have shut out the Raiders three times (1981, 1997, and 2011) and Oakland has done the same twice to Kansas City (2002 and 2012). The record in overtime results is 2-1 in favor of the Chiefs. Marcus Allen won the Super Bowl Most Valuable Player Award with the Raiders in 1982 and the NFL Comeback Player of the Year Award with the Chiefs in 1993. Terdell Sands was drafted by Kansas City in 2001 but became a starter while with Oakland. Quarterback Rich Gannon, who was the Chiefs' starting quarterback in the late 1990s signed with the Raiders for the 1999 season and two years later was named NFL MVP. Wide receiver Andre Rison played for the Chiefs before getting cut prior to the 2000 NFL season. He signed with Oakland later that year. Running back Marcus Allen played for the Raiders in Los Angeles and led the Raiders to victory in Super Bowl XVIII. Allen signed with the Chiefs for the 1993 season after a feud with Raider Managing General Partner Al Davis became public. Allen later reportedly asked to be inducted into the Pro Football Hall of Fame as a member of the Chiefs, even though unlike the National Baseball Hall of Fame, the Pro Football Hall of Fame doesn't induct players on a certain team. Backup quarterback Tom Flores won a Super Bowl with the Chiefs in 1969, but never started in Kansas City. Flores became head coach of the Raiders 10 years later and led the team to two Super Bowl titles. Former Chiefs head coach and defensive coordinator Gunther Cunningham spent four years with the Los Angeles Raiders (1991–94) as the team's defensive coordinator. He joined the Chiefs in 1995. Cornerback Albert Lewis and running back Harvey Williams started their careers in Kansas City but were traded to the Raiders in 1994. Quarterback JaMarcus Russell and wide receiver Dwayne Bowe hold many records while attending Louisiana State University. In the 2007 NFL Draft, Russell would be drafted to the Raiders (#1 overall) and Bowe would be drafted to the Chiefs (#23 overall). Also, during the following draft (2008 NFL Draft), LSU's defensive tackle Glenn Dorsey would also be drafted to the Chiefs (#5 overall). Even in 2009, LSU's defensive end Tyson Jackson would be drafted by the Chiefs in the first round. Defensive tackle Terdell Sands was drafted by the Chiefs in 2001. After a few seasons, Sands signed with the Raiders to become their starter on the defensive line. Raiders running back Bo Jackson spent most of his Major League Baseball career with the Kansas City Royals. In 1962, the Chiefs traded their original quarterback Cotton Davidson to the Raiders for the first overall selection in the 1963 AFL Draft, which was used by the Chiefs to select future Hall of Famer Buck Buchanan. We knew we had to go through Oakland to win the championship, and they knew they had to go through Kansas City...that made it a very bitter rivalry. Those were my favorite games...I always likened them to a heavyweight fight. You knew you were going to get beat up, but it was fun. We needed the Chiefs. We wouldn't have been as good without them. — Ben Davidson, former Raiders defensive end. It's something special. It's not just media hype...You can sense it with coaches and players. Then you get out into the community, and you realize what a huge game this is for both cities. — Will Shields, former Chiefs offensive guard. In Oakland...the games you always really wanted to come see were the Niners and the Chiefs. You grew up hating red...It goes deep. It's not just the teams. It's the organizations, you know, which organization is better? These are two teams that played in the old AFL against each other. Most of the history goes back to it. They've been AFC West rivals for a very, very long time. It's always been the must-win game. — Kirk Morrison, former Raiders linebacker. It's a dark game. I characterize it as a lot of darkness." When asked whether "dark" was meant as 'a good vs. evil dark'—"You can read between the lines. — Gunther Cunningham, former Raiders defensive coordinator and former Chiefs Head coach and defensive coordinator, currently working as the Detroit Lions defensive coordinator. — Harvey Williams (who was with Oakland that season after four years in Kansas City) in a 1995 NBC interview for the team's first meeting in Oakland since 1981. ↑ The Raiders and Kansas City Chiefs finished tied with a 12–2 record, but the Raiders were crowned 1968 division champions. Both teams qualified for the AFL playoffs. ↑ Since the AFL–NFL merger, the Chiefs have never won the AFC Championship. ↑ The Chiefs and Raiders met only once during the strike-shortened 1982 season. 1 2 The Raiders relocated from Oakland to Los Angeles in 1982, and played their home games at the Los Angeles Memorial Coliseum from 1982–1994, before returning to Oakland in 1995. 1 2 3 4 5 6 7 8 9 10 "Kansas City Chiefs vs. Oakland Raiders All Time Results". The Football Database. 1 2 "Top 10 NFL Rivalries of All Time". Sports Illustrated. si.com. ↑ "Oakland Raiders' Record by Opponent". The Football Database. 1 2 "1960 Dallas Texans Statistics & Players - Pro-Football-Reference.com". Retrieved August 29, 2016. 1 2 "1960 Oakland Raiders Statistics & Players - Pro-Football-Reference.com". Retrieved August 29, 2016. 1 2 3 "1969 Kansas City Chiefs Statistics & Players - Pro-Football-Reference.com". Retrieved August 29, 2016. 1 2 "1969 Oakland Raiders Statistics & Players - Pro-Football-Reference.com". Retrieved August 29, 2016. ↑ "1976 Oakland Raiders Statistics & Players - Pro-Football-Reference.com". Retrieved August 29, 2016. ↑ Chiefs cheerleaders and mascots, Accessed March 15, 2008. ↑ "1980 Oakland Raiders Statistics & Players - Pro-Football-Reference.com". Retrieved August 29, 2016. ↑ "1983 Los Angeles Raiders Statistics & Players - Pro-Football-Reference.com". Retrieved August 29, 2016. ↑ "1986 Kansas City Chiefs Statistics & Players - Pro-Football-Reference.com". Retrieved August 29, 2016. ↑ Raiders die with their boots on SFGate.com, 3 January 2000. ↑ "Raiders vs. Chiefs - Game Recap - September 14, 2008 - ESPN". Retrieved August 29, 2016. ↑ Associated Press (2008-11-30). "Johnson's 2-yard plunge lifts Chiefs over woeful Raiders". ESPN. Retrieved 2008-12-01. ↑ "Raiders vs. Chiefs - Game Recap - September 20, 2009 - ESPN". Retrieved August 29, 2016. ↑ Dunning, Matt. "Kansas City Chiefs face lawsuit over stadium brawl - Business Insurance". Retrieved August 29, 2016. ↑ Kuhla, Andrew. "Arrowhead Sets World Record For Loudest Stadium". Fansided. Retrieved 13 October 2013. ↑ "Boxscore finder: Kansas City Chiefs vs Oakland/Los Angeles Raiders". Pro-Football-Reference. June 16, 2014. Retrieved June 16, 2014. ↑ Associated Press. Oakland rookie well-versed in Raiders-Chiefs rivalry ESPN.com, 15 September 2005. ↑ Branch, John. Rivalry depends on point of view Colorado Springs Gazette, 4 December 1999.